The Who are among the headliners announced for the New Orleans Jazz & Heritage Festival this spring. The band will perform on April 25 – marking their first U.S. festival appearance in more than 40 years – topping a bill that includes John Legend, Ryan Adams, Robert Cray and dozens more. The April 24-May 3 event will also feature headliners Elton John, Keith Urban, Jimmy Buffett, No Doubt and Widespread Panic. The Who’s previous iconic U.S. festival appearances include 1967’s Monterey Pop Festival – where a coin toss decided whether they or Jimi Hendrix would close the show – and at Woodstock in 1969, where Pete Townshend kicked Abbie Hoffman off the stage when Hoffman interrupted their set to make a political speech. Tickets for the New Orleans Jazz & Heritage Festival go on sale Tuesday, January 13 at 10:00 AM (CT) via www.nojazzfest.com and www.ticketmaster.com, at all Ticketmaster outlets or by calling (800) 745-3000. 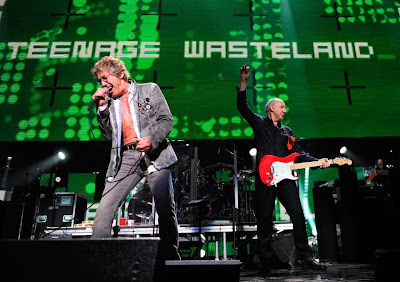 The Who’s appearance is part of their farewell tour, “The Who Hits 50!”, which recently completed a series of UK dates; the band will launch a North American run in Tampa, Florida on April 15.